I haven't seen or heard the traditional Neapolitan Christmas musicians much this year, but then I have been avoiding the crowded areas of town where they are most likely to appear. They are buskers —street musicians— and there are always two of them, dressed as shepherds; one plays the Neapolitan bagpipe, called the zampogna and the other plays the ciaramella, a kind of folk oboe. It seems to me that they always play the same thing: a melancholy, minor carol called, in the original Neapolitan, Quanno Nascette Ninno (When the Child was Born), said to be by Alfonso Maria de’ Liguori (1696-1787) a famous Neapolitan cleric and founder of the Catholic order known as The Redemptorists, or the Congregation of the Most Holy Redeemer. 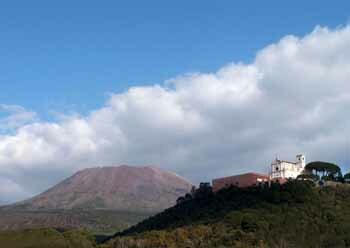 The order resides in a strikingly picturesque monastery on a knoll on the slopes of Vesuvius (photo, left). (The hill, itself, is now named for Alfonso, proclaimed St. Alfonso in 1839. The property came into possession of the Redemptorists in the 1950s. The church on the grounds is named San Michele Arcangelo. Separate item here.) That carol is the basis for the best known Italian carol, Tu Scendi dalle Stelle, except that the newer, Italian version is in a major key. The Italian words are apparently by Pope Pius IX (1846-1878). If known to an English-language audience at all, Tu Scendi dalle Stelle is known as From Starry Skies Descending. It still sounds to me as if the only thing the Pope did was happy up the original a bit by putting it in a major key. In an unrelated (I think) episode, this is the same Pope who proclaimed de' Liguori Doctor of the Church in 1871. Italian translations of carols from other languages abound, but there is not the strong English and German tradition of the carol, nor is there anything like the mid-20th-century American secular Christmas song, ones such as Silver Bells, Have Yourself a Merry Little Christmas, I’ll Be Home for Christmas, and White Christmas. In any event, in a crowded bookshop this morning, while jousting for one of the few remaining copies of a book my wife wants for Christmas, I was mistreated to a horrible version of Oh, Holy Night, being pop-sung through the in-house audio system by some American singer whose name I do not know.